What a great find this children’s book is. Our school librarian has said that books about dragons are in great demand, and here’s one I never heard of. Even better, this book reads like an old fashioned tale as each head of the dragon tells of an earlier encounter with a child who trusted and helped the dragon. It’s very refreshing to read stories about dragons which show their gentle yet powerful nature. 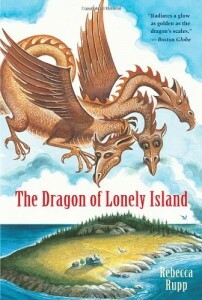 It’s also not surprising that in each of the dragon’s tales in this children’s book, the hero or heroine is a child. The entire book is an homage to the innocence of childhood, and how important it is to protect it. Dragons represent that trusting world that children live in, if we let them. I especially love that this children’s book has no violence or killing, and repeatedly emphasizes peacefulness. I can’t think of one reason that you wouldn’t want to have this children’s book available for your young child, whether they are reading independently or not. It makes a lovely read-aloud, and it is perfect for the reading skills of third or fourth grade students. This book could surely be read several times. There’s a sequel, but I haven’t yet read it.